Donated by: John Hedger, Spectra Services Victoria. 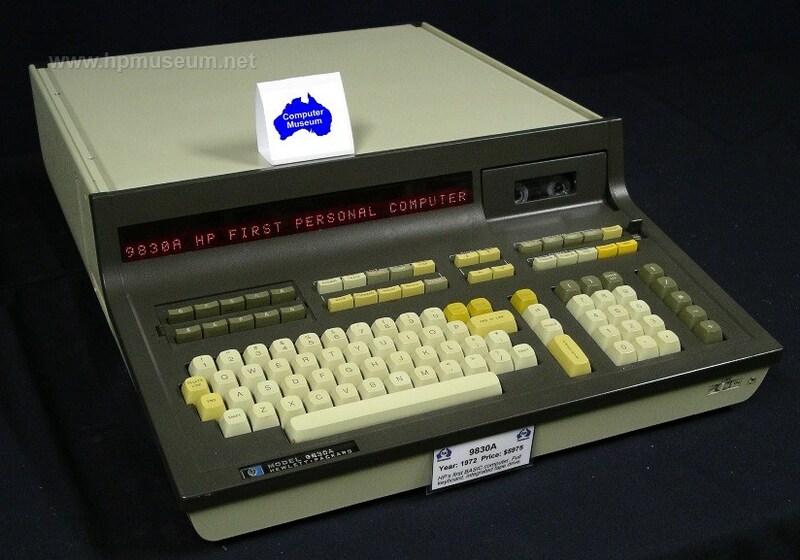 The 9830A was HP's first desktop BASIC computer. It came standard with a single-line LED display and a tape cassette mass storage mechanism. A single tape cassette could hold up to 80K of information. It also came standard with 3520 bytes of user memory, expandable to 7616 bytes. 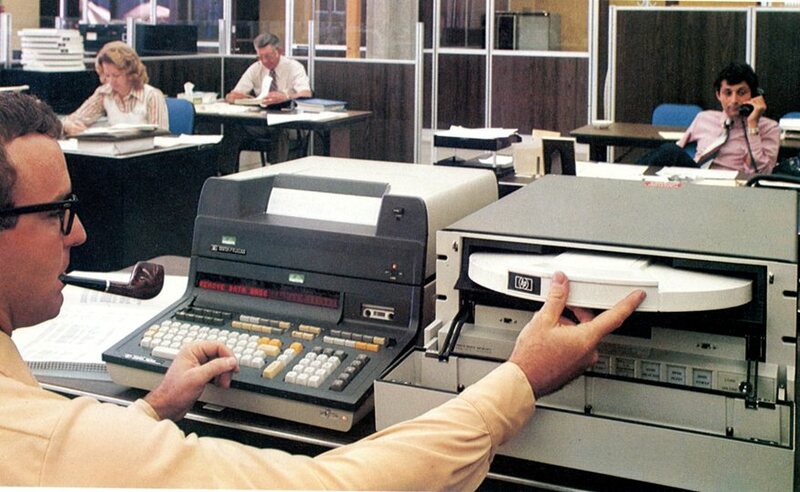 It was expandable via internal or external pluggable ROMs for additional programming capabilities or I/O control. The 9830B was introduced in 1976. 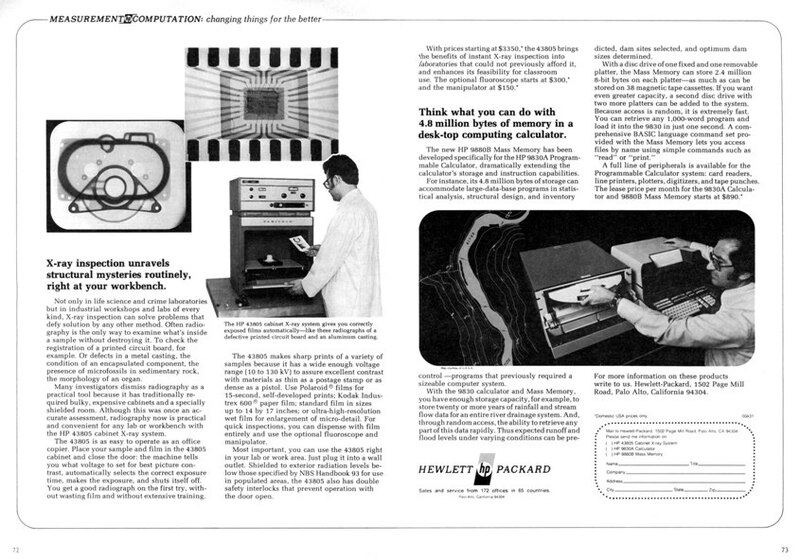 It came standard with 15,808 bytes of user memory, expandable to 30,144 bytes, with an introductory list price of $8350. The tape drive mechanism for the 9865A and the 9830A was made by International Computer Products of Dallas Texas. The Datormuseum has very useful information on fixing 9830 computers. Click here to see Mattis Lind's video on the 9830B.. The 9830 was a great, early computer. Its BASIC programming language is easy to learn and fairly intuitive. These machines are fairly robust. All of the ten or so peripheral interface cables that the museum has tested have worked. The most common failure mode with the 9830 is a working fan and power supply but no display. This is almost always caused by a defective PCB within the computer. The culprit could be any one of the 15 or so pluggable PCBs inside the machine. There is no one common board that fails. In 2003, the museum received a group of 4 units, none of which worked. The failure ended up being a different board in each machine. The fault is easy to identify IF you have a working model with which to board swap. The museum has had the good fortune of being able to keep 4 units operating with only a single unit for spare parts (thanks to the apparent uniformity of failure among the internal PCBs). A spare 9820 or 9810 is also handy to troubleshoot a bad 9830 as these machines share some common internal PCBs. Fixing the individual faulty PCB is a challenge. This becomes a matter of component test/replace (provided the faulty component can still be sourced). Discreet electronic components can generally be sourced, but ICs cannot. Another, less common failure mode for the 9830 is a faulty interface connection in the rear of the machine. There are four connection slots in the rear. Don't forget to try each slot before concluding that your interface cable, ROM or peripheral is faulty. It is unusual for more than one of the interface slots to be faulty. If your 9830 seems to work fine (display, fan, etc), But gives you an error message when you try to store a program line, then you probably have a defective memory board. For example, if you try to STORE the program line 10 Y=X+2, and get an error 16, then you have a bad memory board (even though error 16 means that you are missing parenthesis in your expression). If you press a number or character key on your 9830 keyboard, but the display shows a different character than the one you pushed, this means that your keyboard control PCB (in the keyboard assembly) is bad. 9830 tape drives have not aged well. Less than a third of the units at the museum work as of 2013. They are much slower than the tape drives on the 9815, 9825, 9845 and 85, but tapes themselves are much more reliable. More than ninety percent of our 9830 tapes still work fine. Furthermore, you can use standard audio tapes in the 9830 decks. We have had good success with tapes between 15 and 60 minutes in length, but poor success with longer tapes. Tape cases that are transluscent or white in color work best. These cases make it easier for the deck to read the clear end-of-tape leaders. You can get tapes with black and gray cases to work by painting the underside of the case with white out. An odd failure with the tape decks occurs when the tape recognition lamp fails. When you turn your 9830 on, a small light should come on in your tape deck. If this light is not working, you may still be able to read (and execute) programs from tape, but you will not be able to mark new tapes or store data to your tape. The biggest problem with the old tape drives is that they physically slow down over time. This is due to the degradation of the photoresistor in the tape sensing circuit. Rik Bos has figured out how to fix this problem with modern components. Please go the the 9865A page and click the "Product Documentation" link for details.